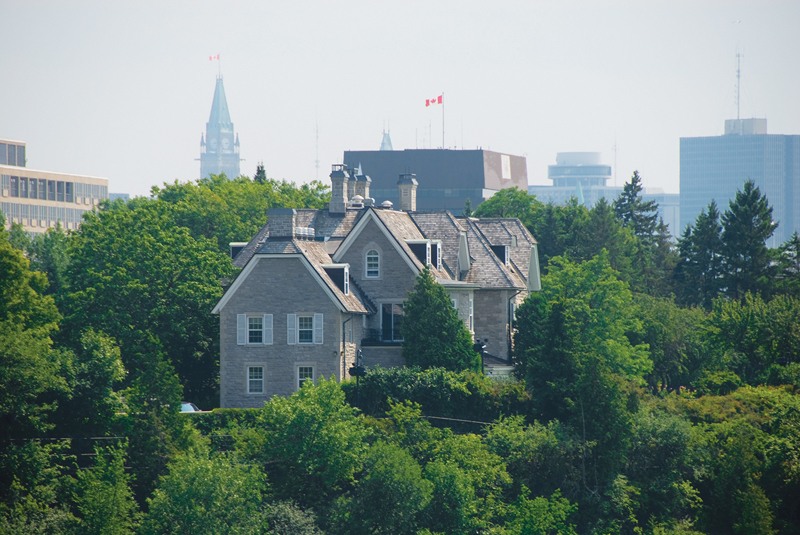 The prime minister’s official residence at 24 Sussex Drive is in critical condition. Its last major renovation was in 1951, and, according to an NCC report issued last year, its building systems “have reached the point of imminent or actual failure.” There is no central air conditioning, so window units are used in each room. The wiring poses a fire hazard. A pool building, added in the 1970s, is rotting and mouldy. The NCC estimates that the house will cost $34.53 million to rehabilitate. Renovating the house is a political hot potato: no prime minister wants to be seen as spending public money on improving 24 Sussex for their personal comfort. It’s a theme embedded in the history of the house. When the decision was made in 1950 to refurbish the property as an official residence, Prime Minister Louis St. Laurent moved in reluctantly, and insisted on paying rent—a practice that continued until 1971. This sense of parsimony has, it seems, also been extended to the visioning of the house itself. It’s a designated heritage property, which makes it politically safest to undertake a sensitive (and preferably undetectable) renewal, if and when the decision is made to proceed. But could more be done? Some have called for an outright demolition of the building, which would set a dangerous precedent for heritage structures. A more realistic approach may be a hybrid of conservation and contemporary design. How might elements of the original Victorian structure be combined with the most salient moves in the 1950 renovation, and contemporary upgrades be sensitively layered onto these? Since the house will need to be gutted, and only its exterior features are designated, what about preserving the envelope, and re-planning the building’s entire interior? Is there a way to render the residence net-zero energy and net-zero carbon, showing how these goals can be accomplished within a 150-year-old structure? What about holding an open architectural design competition, soliciting approaches that give the house a fresh identity firmly rooted in its heritage? One needn’t look far for inspiration. As part of the Parliamentary Precinct renewal, a number of heritage buildings have been rehabilitated to accommodate demanding new uses, while benefitting from a contemporary architectural vision. The just-completed West Block puts the House of Commons in a state-of-the-art, glass-roofed courtyard, remade from an exterior service area. Union Station is now housing the temporary Senate, showcasing careful restoration along with contemporary craft and architectural interventions . The former Bank of Montreal building has been brilliantly restored and refurbished as a high-tech conference centre. As part of the renewal, the program of the residence should also be revisited, in public view—a process that could help dispel perceptions of the rehabilitation as a prime ministerial extravagance. In fact, only 20 percent of the building is designated as a private space for the prime minister and his or her family. The rest is office and State space—although at present, areas such as the dining room are too large for a family and too small for State dinners. Making these areas more functional would help the building be better used (and seen) as a diplomatic venue, and not just a private residence. Other functions may also be added—high-level meeting spaces, reception areas, room for a researcher-in-residence. The upcoming election makes this a good moment to take action on 24 Sussex, as it’s not a given that the current prime minister will occupy the house. Debate over the future of the property recently flared up in the wake of a New York Times article about Justin Trudeau’s “official fixer-upper.” The state of 24 Sussex is a national embarrassment. But it might, with a bit of political courage, be transformed into an opportunity to showcase the expertise of Canada’s best heritage professionals and architects.